Scrooser Is a Fuelless Foot-Powered Scooter That Makes You Feel Like Superman! Although it looks like a something out of the Batman franchise, the Scrooser is a real foot-powered scooter that helps commuters cruise the city at speeds up to 15 miles per hour without using a drop of fuel. The cool-looking vehicle features an impulse drive electric motor that augments the energy generated by the rider’s foot pushing off. A single charge of the lithium-ion battery should last about 25 days in Eco-Mode in an urban environment. 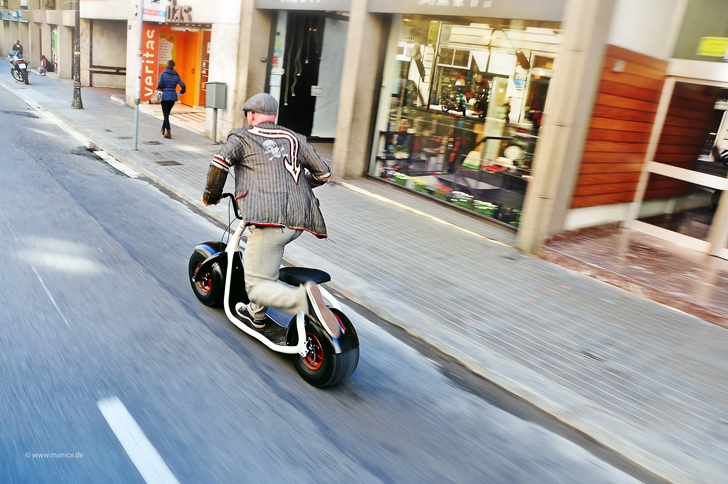 The Scrooser looks incredibly fun – like an electric bike, it combines battery and human power to make you look and feel a bit like Superman. With each push of the foot the electric motor activates intelligently and augments the speed to reach up to 15 miles an hour. This means that the scooter enables you to exercise while on your way to meet friends without breaking into a heavy sweat. The vehicle’s motor assists the rider’s legs and provides less than 100 percent of power required to move. When in Eco-Mode, the scooter should have enough power in its lithium-ion batteries for 25 days of fuel-free rides. The attractive look of the Scrooser and the eco-friendly idea behind it resulted in a more than successful Kickstarter Campaign. The team managed to raise $186,000, passing their original $120,000 goal by more than $66K! The first batch of commercially available Scroosers, still in development, will count 150 vehicles. They can be preordered through the project’s official website. As an avid cyclist I don't want to see these things in my way on the street. But it's obvious that it will not be allowed on the sidewalk. Wonder how well it will fair going up a grade. Have they even decided how much they will be?? At 15 miles and hour would my feet and my shoes be able to stop it? ?